Oaklands Sunset Markets aim to build a place where everyone is welcome to purchase locally made and farmed goods to support a resilient local economy. 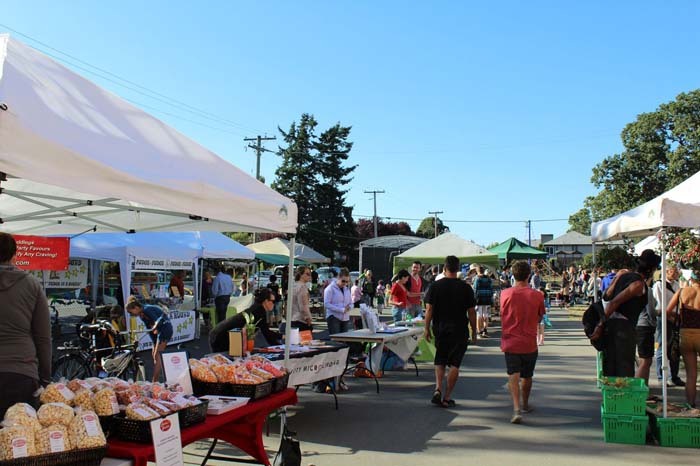 Local vendors include organic farmers, bakers and artisans providing organic fruits and vegetables, meats, breads, baked goods, teas, oils, crafts, pottery and jewelry. The International Women’s Co-op offers delicious ethnic foods to enjoy and many community tables offer the chance to learn about food security, composting, renewable energy and how you can make a difference in creating a greener, healthier community. Enjoy live music and locally crafted beer in the beer garden. Kids will also enjoy face-painting, bubbles and craft-making stations. This market which began in 2011 now boasts 50 vendors and an average of 300 weekly visitors. Past market themes have included a Community Talent Show, Picnic at Sunset, and an Eco Fashion Show and Clothing Swap. Open every second and fourth Wednesday of the month, 4:30pm to 8:30pm, mid-June to end of August. Oaklands Community Centre, 2827 Belmont Ave.